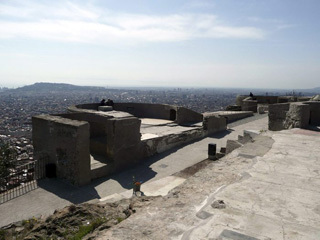 During the spanish civil war (1936-1939), the city built its anti-aircraft battery at the top of the Turó de la Rovira mountain where, in the past, it offered the best defense position, and nowadays, one of the best 360 degrees views of Barcelona. Before to talk about the view, I will tell you a little about the history because when you will be there, you will discover ruins of this defense, which were restored in 2011 including the barrack neighborhood of this area. with the bomber Savoia S79. Barcelona was not at all prepared for this situation so the first things that, the catalan government did, were to put 3 measures: the detection, the contingency and the safety of the citizens. 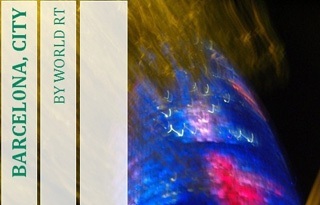 For instance, the construction of underground shelters and the use of the metro as anti-aircraft shelters. On may, the special unit called DECA (Defensa Especial Contra Aeronaus – Special Defense Against Aircraft) was created and after a deep analysis of the field, they decided to build the anti-aircraft battery at the Turó de la Rovira mountain. 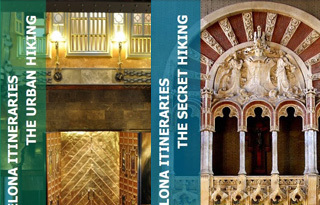 With its 262 meters high, it was considered as the best panoramic view of Barcelona so offering a great defense. At the beginning of november, the area was in construction and at the beginning of 1938, the battery was operational which included the command center, showers, toilets, kitchens and rooms for soldiers and officers. 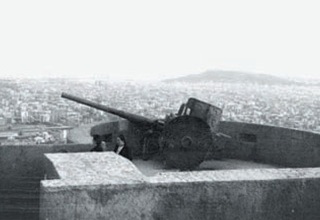 On the top, 4 cannons (model Vickers 105 mm) were installed; they owned a range between 7000 meters and 13000 meters, allowing to cover the city in all directions and to create a fire barrier against the enemies. At the end, Franco won the war on april 1, 1939 and until his death on november 20, 1975, Spain lived its dictator period of the 20th century but Barcelona surrendered few months before, on january 26, 1939. Just before this day, the catalan army destroyed the cannons so that the enemy wouldn’t use them. Before this period, just let me tell you quickly that, originally, there was an iberian population living in this mountain, later, a kind of medieval fortified farmhouse. 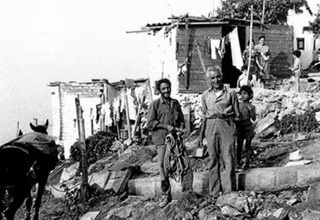 And after the civil war, due to the increasing of the population because of the immigration, people started to use the foundation of the battery to build houses between 1944 and 1990, this period was called the barraquisme (hut period). 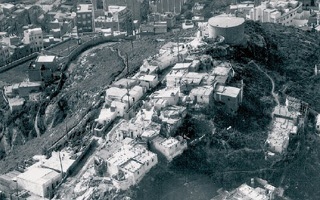 The area was known as the Hut of the Cannons neighborhood with more or less 600 residents and 110 shacks. Like you can guess, most of them were poor people. 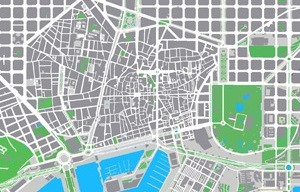 Actually, the neighborhood is called Can Baro in the Horta Guinardo district. That’s it for the history, hope I didn’t bore you !!! 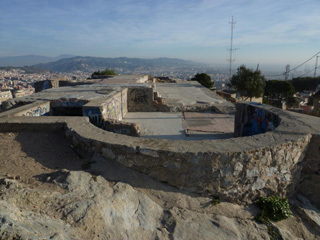 Now what you can do once on the top except to discover the ruins, well the great 360 degrees views, much better than the one from the top of the park guell. You will see the whole city, not only the city itself but also its outskirts and some of its towns. 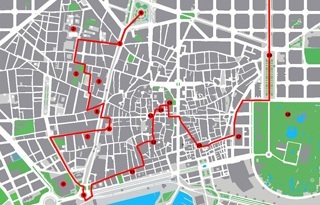 by metro L3 green line: passeig de gracia station then L4 yellow line to get off at the alfons X station then about 25 minutes hard walk. by metro L3 green line: diagonal station then L5 blue line to get off at the el carmel metro station when walk down a little the street, on your first right, there is a bus stop, take number 119 and last stop. 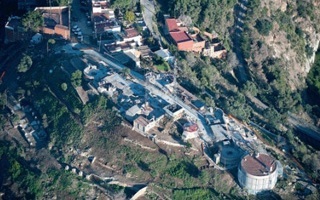 by bus 24 or 28: conca de tremp stop then take the bus 119 to get off at the last stop then about 10 minutes easy walk.